Tanita is greatly missed by us! She was such a great dog and she learned me so much about this beautiful breed. 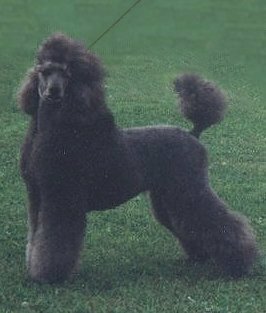 She showed me what a poodle should be like and I will always have her great personality in my mind when I search for the great poodle. I feel blessed that I had these 12 wonderful years with this fantastic dog. Mimmis is deeply missed by us. She was my second poodle. She was a really great dog also but so different from Tanita - Mimmi just loved everybody and was happy if someone scratched her. 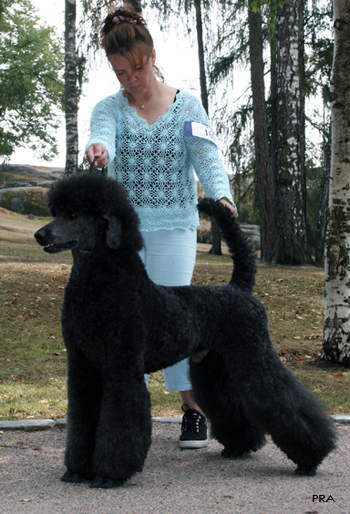 Sadly her color faded quickly and she turned blue, but was shown at the age of 11 and won several CC and was also BOB. She spread lots of joy during her 13 years with us. Rekku has passed away and he is greatly missed by all our family members. He was a special boy who amazed judges and other breeders with his carriage, movement and temperament when he started his show career at the age of ten.